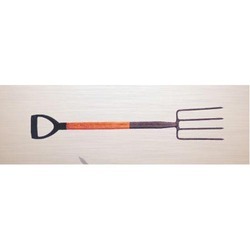 We offer Carbon Steel Weeding Fork. Brand: Bright India Corp. Pvt. Ltd. These are made of high quality raw material, which ensures their strength and longer life. Further, these are fabricated from high grade raw material to ensure their high performance with minimum defects. We manufacture Contractor Fork that are durable, superior in quality and have long handles for perfect grip and ease of work. Made from high quality raw materials, these spades are polished and smooth. Available in various sizes and shapes, these shovels are available at reasonable prices. Fork Shovel is manufactured by us and marketed across the globe for lifting and moving loose material such as coal, gravel, snow, soil, or sand. This hand tool consists of a broad blade with edges or sides, which is fixed to a medium-length handle. The entire range is available at very reasonable and market leading prices. We are offering our clients with bend plastic forks which are made of high grade raw material with the use of sophisticated machines. These are tested stringently for quality before getting supplied to ensure that our clients get the qualitative range. Moreover, these are provided in customized sizes at highly competitive prices. Epoxy coated carbon steel fully hardened & tempered. The tubular plastic D hilt handle is designed for comfort in use. Forks are designed to use particularly when digging by remaining cleaner & are not liable to clogging especially in heavy or clay type soil.